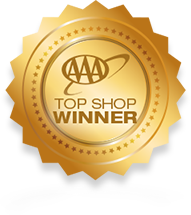 Being a AAA Top Shop Award Winner means doing our best every day to keep you safe and your vehicle healthy. Winning this award for over 7 years in a row is a great honor. Our staff works hard to ensure the strict requirement and guidelines are met. Exceeding the highest standards keeps you comfortable in our shop or behind the wheel of your car. Our ASE Certified technicians are always friendly and keep up to date with the latest information to ensure your vehicle has never been in better hands. Your 100% satisfaction is our #1 goal and we know that’s done with exceptional auto service and customer care. An annual inspection by AAA representatives. Staff an Automotive Service Excellence (ASE) certified technician or equivalent for each area of service offered. Guarantee effectiveness of repairs, parts, labor or components for 36 months/36,000 miles for AAA members. Accept the final decision of AAA in resolving complaints concerning service to members’ vehicles. Maintain customer surveys with at least a 90 percent approval rating. Remain actively involved in the community through service groups and charities. Uphold an exemplary business reputation. Every year, the Better Business Bureau honors companies that demonstrate excellence and make positive impacts on the marketplace in their communities. These companies are recognized with a Business of the Year Torch Award for their dedication to excellent customer service, exceptional work environment and integrity. University Chevron in Fairbanks, Alaska is pleased and proud to accept the 2011 Alaska Business of the Year Torch Award! We would like to thank the Better Business Bureau for their recognition and our customers for their loyalty and appreciation. We would also like to congratulate those businesses in Oregon and Washington who are also recipients of a 2011 Business of the Year award: Willoughby Hearing Aid Centers located in Portland, Oregon and Andelcare in Bellevue, Washington. We know how much dedication and commitment it takes to build relationships and truly make a difference in our communities. We are proud to be associated with theses fine businesses and to be a part of this BBB recognition. AutoInc.magazine, a monthly publication provides up-to-date authoritative information for the automotive industry. Its dedication to accuracy, quality and integrity is relied on by major concerns around the world. Every year AutoInc. assigns a panel of judges from various walks of life to evaluate submitted web sites for their quality. These judges then provide a list of their picks for the TOP TEN auto repair industry web sites on the internet. Using guidelines and scoring sheets, they take into account: design, impression, purpose, navigation, innovation, appearance, use-ability, action encouragement and credibility. In 2010, University Chevron’s website was listed in AutoInc.magazine’s TOP TEN! AutoInc. is quoted as saying “Our judges praised the site’s easy navigation, interactive maps, embedded video commercial and consumer-oriented content.” We are proud to be considered “The Cream of The Crop” by AutoInc! Thank you, AutoInc. and thanks to all of our loyal and dedicated customers for choosing University Chevron! Mike’s University Chevron has been awarded the 1996 Better Business Bureau’s Local Business of the Year Award! The Better Business Bureau recognizes businesses that strive for excellence. University Chevron is COMMITTED to doing business with honesty and integrity. We not only strive to meet our customer’s needs, we keep the welfare of our community and neighborhood first and foremost in our business practices. 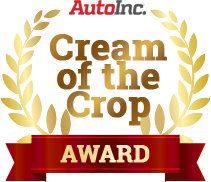 It is with honor, humility and pride that we gratefully accepted this prestigious award. Many thanks to the Better Business Bureau and to our community and customers for their support and recognition over the past few years. 2014 3rd place reader’s choice award winner.